ad broad: i didn't mean those email rules for you! I didn't mean these rules to apply you! I often do postings (like email) on the fly, as quickly as possible, so as to get on to other things. Posts aren't meant to be Proust remember, they are frequently knee-jerk reactions to minor irritants that crop up in the course of a day--like receiving a string of emails in which recipients copy all 154 recipients on saying "thanks" to sender; or a virtual album of baby pics (same setting, different poses) from a proud dad with whom you are barely acquainted. Rest assured, as I wrote this, I was not begrudging your own welcome missives. 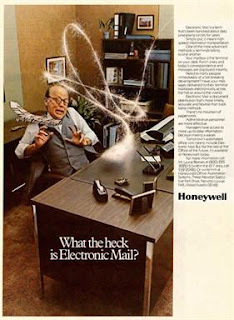 Oh, how I sometimes long for days, far less complicated days, when mail came once a day through a slot in your door or plopped into an inbox on your (actual, real world) desktop. honestly, I think people take communication for granted. There's something irritating about a two line email while there's something glorious about getting an email so long you don't know how to respond to it. suyck... I have to make a post about this some day.